Dog Chew Toys - Do You Know What's Going in Their Mouth? If my dog, Justice, could talk, she'd say that dog chew toys aren't really her thing... unless of course it has some kind of stuffing inside that she can scatter all over the house! The problem with these fabric toys is that in a dog's mouth, it feels the same as your socks, slippers, clothing and anything else of that texture. Your pooch is a lot like a baby in that he puts everything into his mouth to learn about what it is. However, he can't tell any difference between his fabric chew toys and your new pair of sport socks! They both feel the same in his mouth. Now I only give Justice chew toys that don't in any way resemble in texture my clothing, leather purse or couch. What do I mean by that? Well, for example, many people like to give their dogs rawhide or pig ears. What they don't realize though, is that the leathery feel that she experiences in her mouth from these chew objects is a lot like their owner's Italian leather purse, or the couch for that matter. So they are left wondering why in the world Rover gets it in her head that she may gnaw on their shoes and purse which they left sitting on the floor. It really all makes sense when you think about it. Dogs are not people trapped in fur, and they cannot differentiate naturally between right and wrong. Giving your pooch those kind of dog chew toys is only setting her up for a mistake (chewing your purse). If you have a new puppy - great! You are ahead of the game by reading this. You can avoid these chewing problems by giving your pup proper dog chew toys right away. If you have an older dog and are already experiencing some of these problems, remove the offensive toys and replace them with good ones! That brings us to the next question. What are good dog chew toys? Here are some of my favorites, and I'll also explain why! Available in a wide variety of colors, shapes and sizes, there is one out there to suit every dog! The most basic kong is pyramid shaped, with a rounded bottom and hollow inside. A hole at the bottom lets you put a treat inside if you like - the dogs then have to work to get it out. I find what works really well is smearing a tiny bit of peanut butter inside the kong, and then throwing it in the freezer for a while. Now you've got a delicious chew toy that will take much longer for your dog to lick clean - perfect to give him while he's in his crate. 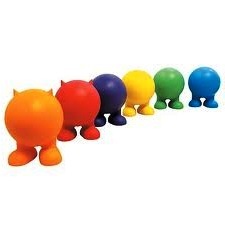 These kong dog toys come in primarily red or black. Is there a difference? You better believe it! The black kong is for strong, aggressive chewers. It is basically indestructible by your dog (and if he does manage to somehow chew it apart, just bring it back for a refund). This is definitely a tough dog toy! The red one is somewhat softer for the average chewer. There are special kongs for puppies as well, usually in a blue and white or pink and white color. Great for your pet's teeth and jaws, kong dog toys also have a weird bounce to them when dropped. Most dogs LOVE this about them, as they are so intriguing. 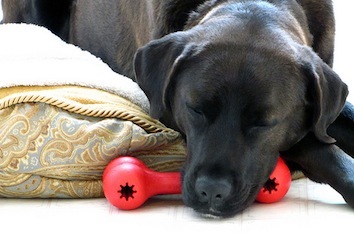 What if your dog isn't really interested in a kong, as she's more into treats? Try giving the kong a bath. Yes, a bath. Boil some water and beef or chicken bouillon cubes and let the kong soak in the hot water overnight (don't worry about the water getting cold). The smell and flavor should last for the dog for a few weeks. Yummy! They come in different sizes, from very small to very large. So does the price. Actually, I paid $18 for a small size antler a couple years ago, but larger ones can go for easily $35! I know, it seems like a rip off, right? That's what I originally thought... until I realized how long it would last. I also love the fact that it doesn't get stinky and gross from Justice's chewing of it, like marrow bones do. It's a very clean chew toy, and is great for her teeth. These are nylon bones that are safe for your dog to chew on. And chew they will! Also available in lots of different shapes, sizes and flavors, dogs love these! Of all the dog chew toys that I have, this is one of Justice's favorite (and remember, she doesn't even really like toys!). You can even get them with little nubs all over the bone, which is like a mini massage on your pooch's gums. 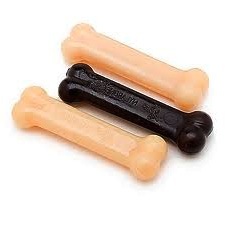 As opposed to real animal bones, which can splinter and hurt their mouth and throat, nylabone dog toys are extremely durable and long lasting. They are not meant to be consumed, so if you notice that your dog has indeed chewed it to pieces, throw it out and find something stronger for him! Maybe a black kong? This is where the squeaky dog toys come in! Rubber dog toys are all over the pet stores. Some squeak, some don't, some are soft, some are hard, some are boring, some are unique. The above photo is of a rubber dog toy called a "Cuz". It has two little feet that make it able to stand up (how cute! ), and squeaks when chewed or squeezed. Because it's rubber, it has a great bounce to it as well. You can also get a rubber chicken dog chew toy if you'd like! Just go to any pet store and browse the racks - I'm sure you'll find something. Don't ever let your dog chew up a tennis ball - the inside is actually TOXIC to your pet! So what can we use them for? Playing fetch! Yes, teach your best friend to play fetch. Good exercise for your dog, it can also be a perfect opportunity to practice some obedience training (making your pet bring it back, release it to you, stay while you throw the ball, then release him to go get it). Have problems getting your dog to bring it back every time or give the ball back to you? Teach your dog to fetch: put a 30 or 50 foot long line on your dog, and hold onto the end. When he picks up the ball and heads the other direction (or tries to get you to chase him), simply reel the line in like you're fishing. Yeah... that will get Dad and the boys interested in playing fetch with the dog! 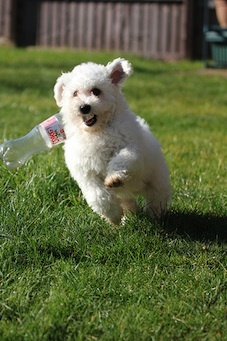 Believe it or not, any pooch will love playing with an empty plastic water bottle. They love how it feels, and especially how it sounds when they crinkle it up. My dog makes a game of getting the cap off the bottle and also the little white ring underneath the cap! I have even seen dog toys in the pet store that have a water bottle inside of a soft stuffing-free animal (squirrel, skunk, etc.). Just be careful - if you have a young puppy or adult dog that is chewing socks and other fabrics around the house, I would avoid any toys that have fabric on them. I hope that gives you enough dog chew toys to choose from now that you have decided to avoid the common pitfall of leading your dog to chew on your shoes! Use common sense, and a bit of knowledge (which you now have), and you and your shoes will be fine.